Bulit-in spare fuse: The travel adapter includes spare fuse for replacement. Internal spike and surge protection circuitry safeguards your valuable devices . 1. This world travel adapter can't work with certain high power appliances. Check your applicance label to see if it requires less than 2000W. 2. Each country has its own regulations regarding the use of travel adapters,please check in each country before use. 3. 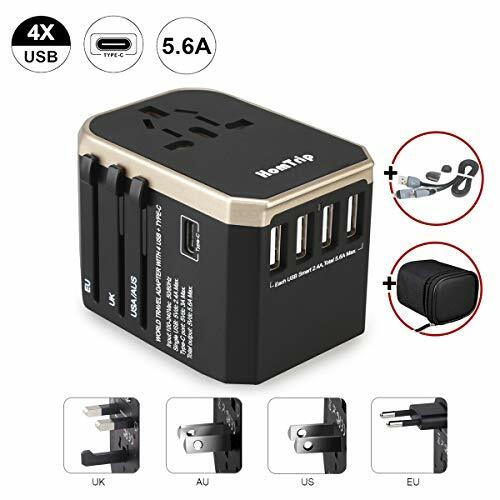 This travel power adapter can't convert voltage, to avoid damage to your device,please make sure the power outlet you want to use has the proper voltage to run your device before using this adapter. 4. The power output of USB Type-C Port is 5V 3.0A Max only. If you need to charge Macbook, please use the original Macbook charger, and plug it into the Universal AC Socket when charging.